A river running through the front yard! Woohoo! Oh happy day! An honest-to-goodness gully washer! It was all over in 30 minutes yesterday, but it sure was fun while it lasted. Big rainstorms used to scare me, but then I had gutters put on the house and barn. Now that I don’t have to worry about filling sandbags, life is good again. 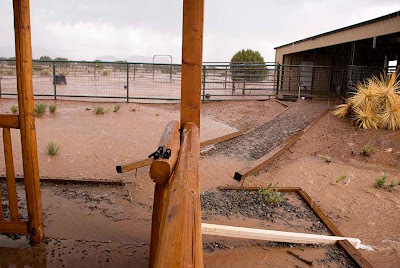 The water from a heavy storm runs down across the corral, takes a right near the front porch, goes under the landscape timbers that line the path to the barn, and meanders harmlessly out into the pasture. Ahh, New Mexico...the land of enchantment and extreme weather. 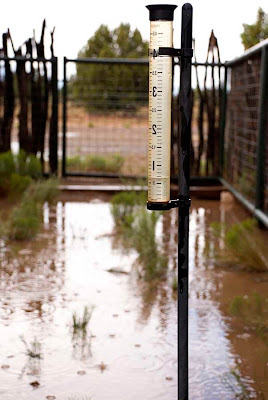 When all was said and done, the rain gauge collected .62” in a half hour. Hank and Lyle ran up to the barn the second it started, but George and Alan got caught way out in the pasture and had to hunker down next to a tree. Mom, where did that pond come from? 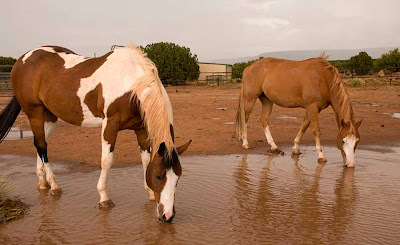 Hank and Lyle enjoyed the taste of fresh rain water. 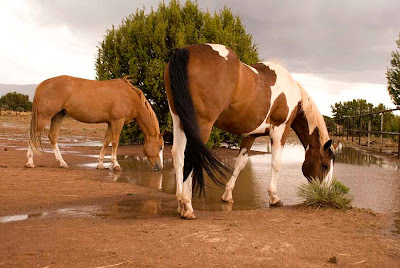 I was tempted to saddle them up and practice our water crossings, but they did a little practice on their own. Hank even stood there for awhile to soak his feet. ...and off they ran for the shelter of the barn. Hurray! Rain. Finally. Wish I could fly out right now and see all the blooms and smell the earth. Looking forward to more photos of earthy things with your new camera. Woah look at all that water! Does it ever flood your house when you get super heavy rain? Wow! What abundance! Glad you finally got some wet stuff. The horses look quite astounded! WOW! That does not look like the 7msn I know! Glad you got some rain! Will the new pond stick around for a while, or dry up pretty fast? Yep, looks like you got a gully washer, for sure! Amazing how hard and fast it can rain and then just disappear again. 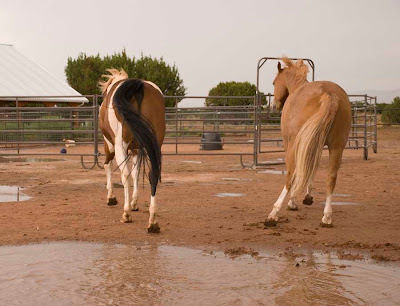 Last night I left my horses out and when I heard it raining I thought, "good, we need the rain." I forgot about the poor guys standing out in it. But they got even, they all rolled and now they are clay horses. I love monsoon season! Do they call it that in New Mexico like they do in Arizona? I can't even imagine what it would have been like to fill sandbags for such an event. Yeppers you got a good dumping! Yay for you! This year's weather's been stranger than usual, I think. Up here in your old stomping grounds, it's been cloudy and drizzly just about every day for the past two weeks. But oddest of all is that our temps have rarely risen past 58 degrees....New Mexico in JULY!! I love your pictures of Hank & Lyle. They are such handsome fellas. 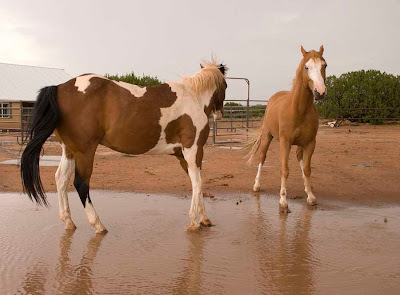 Funny how they changed position and headed for the barn at first rain drops. My Baby Doll will only run for the barn when it's really coming down AND there's hay in there for her. Otherwise she hangs her head low and braces herself for the downpour, crazy girl. Oh! 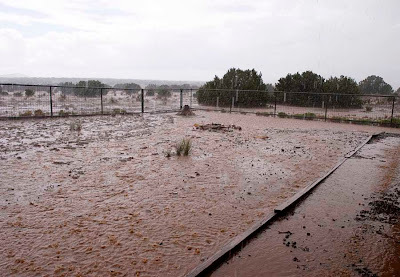 And one thing you forgot to mention about one of the best things about a New Mexico rain, is the amazing scents of wet desert plants and flowers, especially pinon and juniper. New Mexico is so fresh and fragrant after a good rain. Aaahhh! Gecko, the house has never flooded, but there was one really close call the first summer. I had to dig trenches in the middle of an hellacious lightning/rain storm to keep the water out of the back doors. So I had the gutters installed. Whew. Pony Girl, the pond disappeared within an hour. This ground is so dry, it just soaked it right up. 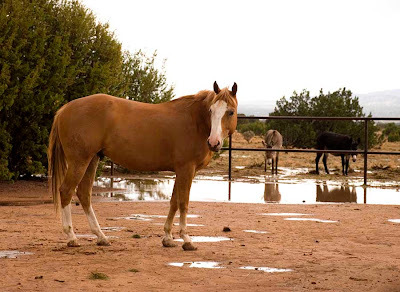 Karen, we do call it the monsoon season in New Mexico. Twinville, I agree, the smells after the rains are amazing. And I love how everything outside is squeaky clean now. The trees look so much greener now that all the dust has been washed off. Hank and Lyle's reaction to the rain falling on them, is hysterical. Nothing like the sweet smell of a summer rainfall. Glad to hear you finally got some. How did the other critters enjoy it? Glad to see you got a good soaking, the boys are very handsome and look like they enjoy getting their feet wet. Can't wait to see if some green comes from this drenching. Great photos especially the last couple. 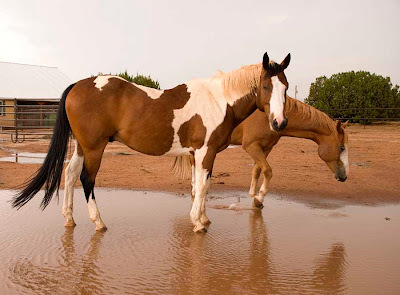 The horses look like they are enjoying the rare rain.